Electronic commutation improves diesel fuel pump life over conventional designs. Electric fuel pumps are a far better design than those driven mechanically off a cam lobe or a belt drive pulley, but even they have problems. Federal-Mogul Corp., has solved one of the longevity bugaboos stemming from electric fuel pump motor brushes. They eliminated them. Electronics replace the brushes in the new 12-volt or 24-volt DC brushless pump, and provide longer life in high-vibration mountings, and in conditions with varying fuel quality. The pump's electrically-driven design also reduces engine load when compared with conventional belt or gear driven pumps. 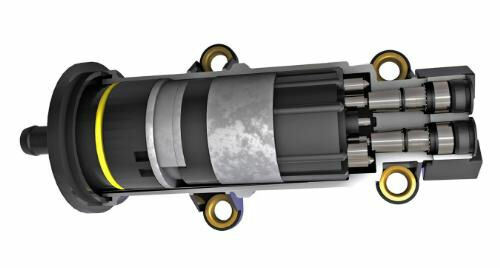 A brushless design helps this new Federal-Mogul Corp. diesel fuel pump working long after traditional designs are scrapped. Federal-Mogul is using this design in many replacement packages for existing brush-style fuel pumps to aid in reducing maintenance costs and down time. The design was conceived in FM's Logansport, Indiana, technical center and is also being manufactured at the firm's factory in Logansport -- to be sold under the Carter brand. The company is also supplying the technology to leading global diesel engine and diesel fuel filtration manufacturers. For more information, visit www.federalmogul.com/brushlessfuelpump.